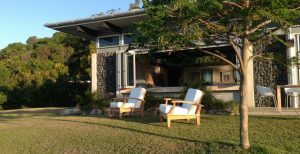 As we said said in part one of this story there’s so much more to southeast Queensland than meets the eye. Surfing beaches are one thing but beech forests are another thing altogether! 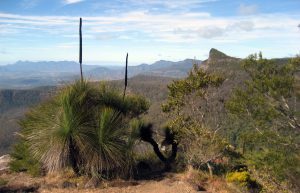 The second of Life’s An Adventure’s walks in the area is the three-day Scenic Rim Walk. The Scenic Rim is a chain of forested mountain ranges forming an expansive quarter circle ridge, that is part of the Great Dividing Range. The imposing rim of mountain ranges date back millions of years, when they were created by volcanic activity. Seriously this place wouldn’t look out of place in a Jurassic Park movie! The area boasts six national parks, four of which are declared World Heritage-listed Gondwana Rainforest of Australia areas. Gondwana what? Basically it’s the most extensive range of subtropical rainforest in the world. Few places on earth contain so many plants and animals which remain relatively unchanged from their ancestors in the fossil record. Also your hosts have a passion for good food. The lodge’s chef is always creating unique menus based on regional foods in season. Meals are produced with a combination of homemade, homegrown and local produce. The flavours and creativity make for memorable meals, all this accompanied with wonderful wines. Probably the same wine you’ll be sipping as you lap up from views from the lounge area! And if you haven’t been ‘Wow’ed enough you’ll get to see all this nature beauty from the air with a scenic helicopter ride that collects you at the end of your walk at Cunninghams Gap and drops you at Kooroomba Vineyards and Lavender Farm for a picnic lunch and wine tasting, a beautiful way to finish the day. 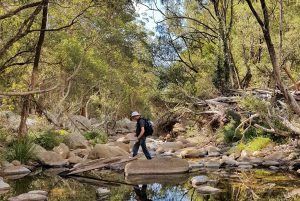 Click here for info on the three-day Scenic Rim Walk here to read about the other fabulous southeast Qld walk.